It's a miserable, yucky, rainy day here in Florida. That's just the perfect time for me to focus on sharing some tips to get you started with Instagram. I'm a newbie too so we can learn together. Help is on the way. Oliver and I just tested out a still shot above and a video to see how easy it is to maneuver without any instruction. Success! Now I'm looking up Instagram's official help page to make sure I don't lead you astray. The Instagram video is super easy too. In a matter of a couple of minutes I took this quicky of Oliver performing his "Speak" and had it up in this post. Go ahead and watch it so you'll know what his voice sounds like. He's a really tough Rambo, yeh?! Are you ready to get started? Grab your iPhone and head for the App Store to download Instagram to your device. You'll find the app available for your Android in GooglePlay. Once the download is complete, tap the Instagram logo to open the app. Tap Register to create a Username and Password. You'll need to fill out some profile information also. Tap Done and you'll be ready to take your first pic to share. Seriously! screen; it looks like the one here at the right. If you don't like your shot, just hit cancel in the upper left corner and try again. If you want to share the pic, you can add effects to edit the pic. Learn more about this at this link and the previous one. I'm eager to play around with the filters that change the color and look of my pics. That's next on my To Do list! Now it's time to share your first pic. After you're done applying effects or filters, hit Next in the top right. You can still change your mind and edit the photo further by hitting the Edit button at top left. The screen is fairly self explanatory. Add a caption or hashtags so others can find your masterpiece. If you'll be joining #BarkFriday #FueltheLove, don't forget to add this statement with the 2 hashtags in there to get credit for your image entry: "I #FueltheLove on #BarkFriday with @ZukesPets". You'll get the maximum number of points for image entries, and you're free to enter daily using a different action-packed photo or video each day. My napping shot of Oliver would not qualify for entry, but the video would. The photo map and location are optional--your choice. Now select the social media sites you'd like to share your image with. Finally, hit the Share button at the top right. Viola! You're done! Now let's view it. 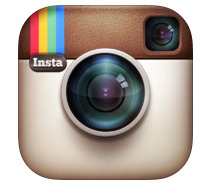 Go back to your device's homepage and click the Instagram button again. It should reopen to your Instagram home page. Select the icon at the bottom right (it looks like a flag to me) and your profile page will appear with any/all of your photos ready to select and share again. Watch for another lesson on how to proceed with resharing your pics and more, coming soon. Videos are up next. Stay tuned! I've been wanting to start an Instagram account for my pet companions too. Everybody seems to have an Instagram account these days. This post is definitely a timely reminder for me!